Sore Throat? This smoothie can help! When I was little I got sick a lot, lots of strep throat and coughing. My grandmother used to make me drink pineapple juice to make it better. She made me drink it so much that for a good long time I couldn't even stomach it anymore. Isn't it funny how when we're little we think everything grown-ups did was just to annoy us and boss us around for no reason. I never understood WHYYY pineapple juice. "Pineapple juice is 500% more effective then cough syrup." I obviously read it right away. It explains that pineapple contains the enzyme bromelain, which is effective in treating inflammation that can be caused by excessive coughing, suppressing the urge to cough more.
" Canned or pasteurized pineapple juice does not contain enough bromelain to have therapeutic effects. It is best to juice a raw pineapple if you are drinking the juice for health benefits. " Fresh pineapple it is. 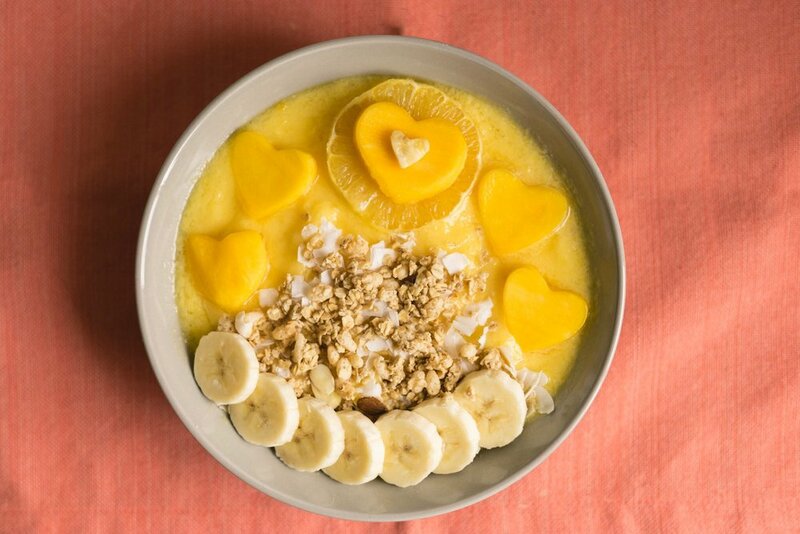 Luckily I had some on hand to make into this amazing vitamin C packed pineapple smoothie bowl. I topped it with extra fruit, fresh bananas, vanilla granola, almonds, and dried coconut slices. Tropical dream. Fingers crossed that you won't need this anytime soon, but in case you do, I hope it helps!